There's no need to drive to Rhinebeck if you come from NYC. Amtrak trains stop at nearby Rhinecliff station, where cabs await. The railroad tracks snake along the Hudson River, providing a magnificently scenic ride. The town of Rhinebeck is normally a quiet, low-key destination. Rhinebeck's history predates that of the United States as a nation. This updated Colonial town is home to the country's oldest inn still in operation. In fact, George Washington himself slept here a decade before the Declaration of Independence was signed. Today Rhinebeck basically consists of two main intersecting roads, Route 9 and Market Street, which cross at the town's single stop light. 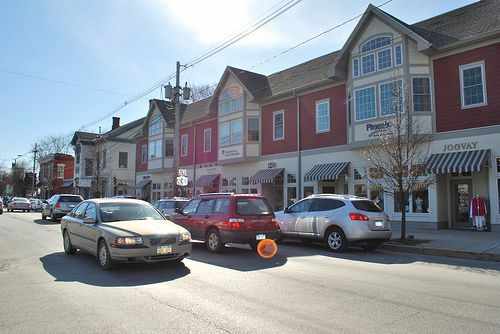 Small, short buildings hold independent shops that provide ample stimulation for browsers and temptation for shoppers. Once a tavern that slaked the thirst of wayfarers, today Foster's Coach House — a Rhinebeck landmark — operates as a family restaurant. Foster's Coach House Tavern was originally built in 1890 and operated under the name The Village Tavern. It was purchased by Wally Foster after World War II, and the interior retains much of the look of his era. One of its most treasured antiques is a coach owned by former U.S. President Benjamin Harrison. It now doubles as a telephone booth. Barber shop is open for business. Time hasn't brought many changes to Rhinebeck. The flavor of classic small-town America lives on in Rhinebeck. Except for a major chain drugstore, you won't find the same big-box stores that have infiltrated so much of America here. Instead, there are small, independently run shops and restaurants along the town's main streets. Couples who want to shop at Wal-Mart, Target, Macy's, Old Navy, Sears, Best Buy, and eat at chain restaurants including Applebee's, McDonald's, Friendly's, and Olive Garden only need to cross the Kingston-Rhinecliff bridge, which leads to larger Kingston, a strip-mall city. Henry Beekman, a member of the New York Assembly, obtained most of the land that is Rhinebeck in 1703. Ryn Beck originally was a small settlement amidst woodlands. Early inhabitants were the Sepasco Indians. In the 1680s, the Dutch began to colonize the area. Rhinebeck's recorded history began in 1697. In the original patent held by Beekman, the property extended to the eastern bank of the Hudson River. A stone building erected in the late 1700s to withstand Indian attacks, the town's Bogardus Tavern played a part in the American Revolution. Prior to the fighting, in 1775 a Continental Army Regiment drilled on its front lawn. During the Revolutionary War, George Washington, Alexander Hamilton, Benedict Arnold, and others slept, ate, and drank here, debating policy and strategies. And when the British came and burned down Kingston, New York's first state capital, across the river, townsfolk took refuge here. The tavern never closed; today is known as The Beekman Arms Hotel. Opened in 1766, the Beekman Arms Hotel is a member of the Historic Hotels of America. Lovers of history will appreciate The Beekman Arms. Not only did George Washington, Aaron Burr, and Alexander Hamilton sleep here at different times, but FDR launched all his political campaigns from the front porch, steps from the center of town. The inn's public rooms include dining areas and a dark tavern. Guest rooms at The Beekman Arms supply a TV, private bathroom, and a decanter of sherry. But like many old hotels, rooms are typically small and furnishings have not kept up with the times. Reviews run the gamut, from people who thrilled to the property to others who complained about a listless staff and facility in need of updating. Continental breakfast is included in the room rate. As most reviewers found the fare disappointing, it's likely visitors who breakfast at nearby Bread Alone instead will start their morning happier. The Beekman Arms is approximately a 90-minute drive from New York City. The long red barn behind The Beekman Arms holds a multi-dealer antiques emporium. Rhinebeck is not known as a cut-rate town, so don't expect to find too many deals in the vicinity. If you're looking to score, check the local paper for auctions and yard sales. You never know what you will find, and prices on the latter are negotiable. Wilderstein is one of several Hudson Valley mansions close to Rhinebeck that are now open to the public. One of the special things to do when visiting Rhinebeck is to explore the historic mansions that dot the area. Many of these mansions are located on the most scenic overlooks of the Hudson River and they feature exhilarating views and lovely gardens along with the interesting homes influential citizens once occupied. Wilderstein is the Hudson Valley mansion closest to Rhinebeck. Built by Thomas Suckley, a wealthy businessman, Wilderstein began as an Italianate-style villa. Subsequent generations transformed it into a multi-gabled Queen Anne style house with a circular five-story tower. Daisy Suckley, the last member of the family to reside in the home, was a cousin of Franklin Delano Roosevelt as well as his alleged mistress. She often traveled with the President, was responsible for gifting him his beloved black Scottie Fala, and was with FDR when he died in Warm Springs, Georgia in 1945. Relative to its size, Rhinebeck contains a substantial number of restaurants. Rhinebeck is surrounded by farms, and the local bounty makes its way to the town's restaurants. If you're driving, you're likely to encounter area farm stands, where the fruits and vegetables couldn't be fresher -- and the homemade pies are worth bringing back to your own home. But don't worry; you won't have to cook during your getaway. Rhinebeck, and the nearby towns of Red Hook, Tivoli, and Pine Plains contain numerous eateries. Ethnic fare in the area is available from local French, Italian, Chinese, Japanese, and Mexican restaurants. For information, including restaurant phone numbers and websites, see Rhinebeck Dining. America's oldest grape-growing and wine-making region, the Hudson Valley is also sprinkled with wineries; some offer tastings. See Hudson Valley Wine Country to plot an intoxicating journey. One of Rhinebeck's cultural treasures, Upstate Films screens new independent and foreign films for sophisticated audiences. Upstate Films first opened in Rhinebeck in 1972 and has prospered through lean years. At this point, it's a local institution and the only place in the area to see interesting, non-Hollywood feature films. Depending on the schedule, Upstate Films may host filmmakers for discussions. Upstate Films is also involved in the Woodstock Film Festival, which takes place in September. For more information, go to Upstate Films. A few times in the year, notably on Valentine's Day and deep winter, when a blanket of snow coats the Hudson Valley, Rhinebeck appears particularly romantic. Clean air, big sky, country roads with negligible traffic, interesting shops, and first-rate restaurants make Rhinebeck a good weekend getaway destination for adults. The annual Dutchess County Fair in Rhinebeck is the highlight of the summer. There are state fairs and county fairs and then there is the Dutchess County Fair, which I personally rate at the top of the list. The Dutchess County Fair features all the standard summer fair fare — a midway, food stalls and restaurants, commercial displays, concession booths. Because Dutchess County encompasses farm country, local 4H members make a particularly strong showing. The displays of live animals, lovingly tended by their young owners, is impressive. Non-farmers have the opportunity to get up close to large animals such as pigs, cows, and steers; visit the pens of sheep and goats; and see prize rabbits and chickens. You can also talk to the people who raised them. And if you've never watched a cow beauty pageant or a sheep shearing demonstration, you're in for something special. For those who love canines above all else, the show of dog agility is always entertaining (especially when some dogs are less than perfectly behaved). Although the selection of blue-ribbon-winning pies in Building E, the Harvest Kitchen, will make your mouth water, they're for display only. Fortunately, the food kiosks -- particularly the ones that sell fresh-roasted corn from local farms and ice cream and milk shakes from local dairies -- will more than satisfy. For dates and more information, visit Dutchess County Fair. One of the best-known Rhinebeck restaurants, Terrapin serves fresh, contemporary fare. Terrapin contains both a bar/bistro for casual gourmet fare and a dining room where prices are higher and preparations more elaborate. In Terrapin's Red Bistro, patrons are welcome to create their own sandwich, choosing from lists of protein (e.g. grilled free range chicken, shredded duck confit), bread (e.g. brioche, baguette, ciabatta, pita), sauces (e.g. horseradish steak sauce, maple mustard, wasabi aioli), and can enhance their selections with freebies (onions, lettuce, tomatoes), cheese, and tasty extras. In the dining room, couples can start with tapas or go straight to appetizers and soup. Salad and pasta choices are plentiful, and entrees range from vegetarian to an 18 oz. dry aged t-bone stead from the Hudson Valley Cattle company. Note: The restaurant offers an organic kids menu, so don't say I didn't warn you that kids may be savoring the food as much as you. Note: Diners can use Open Table to reserve a place at Terrapin.